Michael Ball, Imelda Staunton, Christopher Jordan et al. 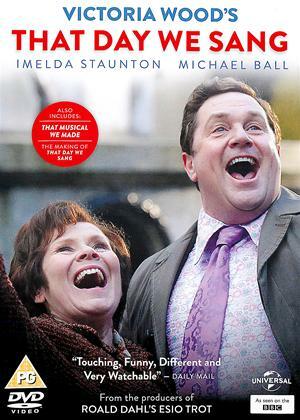 Michael Ball and Imelda Staunton star as Tubby and Enid, reunited in 1960's Manchester, forty years after they sang as children on a famous record. Tubby the lonely insurance man, falls for Enid and embarks on a last chance romance. But for Enid, things are more complicated. Interwoven with their bumpy road to love, is the story of the little boy Jimmy, whose day singing on the record turns out to be the most important day of his life. At first we wondered how the story was going to be developed, and unfamiliar with the camera tricks and angles, as well as the quality of the acting/singing. But we soon warmed to the story, and the manner in which it is told, and settled down for the journey. Some twists took us by surprise, but the film has a satisfying ending. We knew Michael Ball, having seen him live at a BBC studio presenting one of his shows, but not the female lead. She was very good, both singing voice and acting - very believable. And as a couple of 70+ year olds, the era the story covers was very familiar to us.